The Awesome Ramjet :: Bad Advice Column - "Please Respond"
They only seem to reply quickly when they like someone (sometimes- other times they take hrs/days) or it’s something super interesting. Its obvious they read the txt messages or comments earlier just take hours or days to reply. It's hard for me to answer this, because you answer your own questions several times in there. That's a tough cookie to crack. But essentially, males reply late to sms's because A) we forgot to reply earlier, B) we're too cool to reply, C) we're too lazy to reply, or D) you sms'd at 2:38AM and it's not worth getting out of bed at that hour just on the vague possibility that it might be a cute girl wanting a bootie call. There are other reasons, but quite honestly I'm too lazy to list them. Heck, it already took me like 5 days to answer this question. Which I thought I did straight away, really. I just forgot. 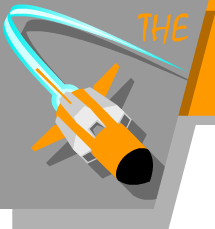 The Awesome Ramjet, The Awesome Ramjet Logo, and all images within this site are © copyright 2007-19 by Coramaximus. All rights reserved.